This was modeled in Spaceclaim Engineer and rendered in Keyshot. 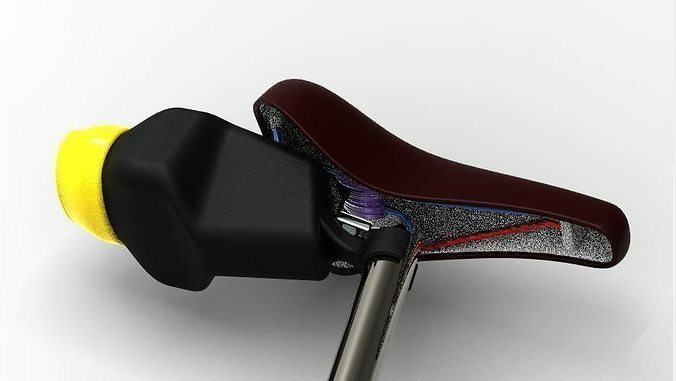 The bicycle seat that it was designed around was downloaded from Grabcad. The idea behind this bike case is that it is made out of any rubber like material, such as what is available on Shapeways, Objet Printers, or others. The case needs to be stiffer than the cover. The reason is that the case needs to maintain its grip on the seatpost and the seat support bars while loaded. For that reason a high durometer material should be used. The cover needs to be more flexible so that when squeezed, the slot opens. The inspiration is a small rubber coinpurse.